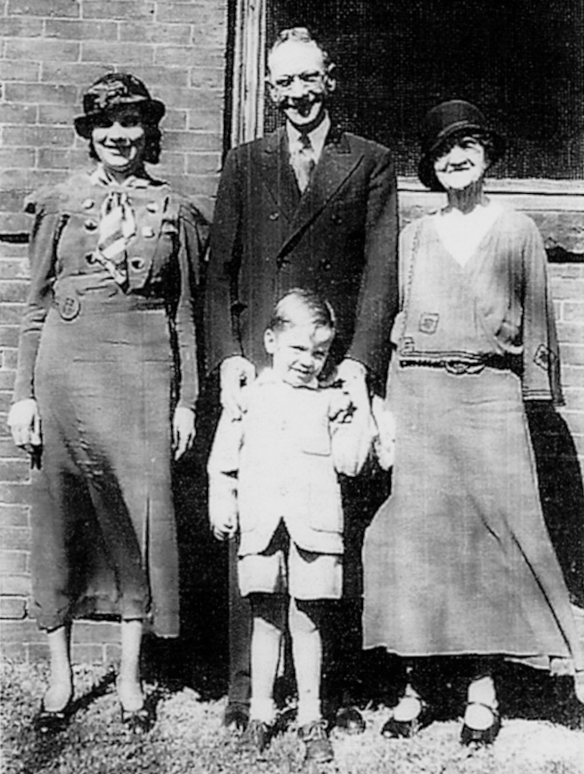 Four Generations of Chambers-Boling Family (left to right): Helen Louise Chambers Boling, daughter of Frank Maynard Chambers (center), Maude Johnston Chambers, mother of Frank Maynard Chambers; Forefront center, Frank Burton Boling, son of Helen Louise Chambers, grandson, and great-grandson of others. For years, I thought there were no pictures of my dad as a little boy and especially none of his mother Helen Louise Chambers (1911-1944) born in Philadelphia, daughter of Frank Maynard Chambers (1864-1967) from Marion, Pennsylvania and Lottie Taylor (1890-1962) from Culpeper, Virginia. I had totally forgotten that I made special albums in 2002 for mom for Mother’s Day and Dad for Father’s Day. Lo and behold, dad’s album had the one and the only picture that I am aware of that includes not only my dad and his mother together, but also his grandfather Frank Maynard and great-grandmother Maude (Little Grandma) Johnston Chambers. Today was truly the first day that I closely examined this photo. I noticed immediately that my dad’s sister, Aunt Delores Ann Boling Stambaugh (1930-2008) bore a strong resemblance to her mother, Helen. Please note also that Maude’s left arm and hand are not shown. Her top does have a slight bulge on her left side. Perhaps she injured her arm and tucked it into her dress? And finally, my dad and his mom captured moment together is quite significant. As well, as my dad with his grandfather, Frank Maynard. If you have read any of my earlier posts about the Chambers-Taylor-Boling families (listed below) you will remember that Helen estranged herself from her husband Jesse Boling and their children when my dad was only 5. And, Frank Maynard Chambers estranged himself from Lottie and the remaining family members in 1939-40. My best guess is that this photo was taken when my dad, Frank Burton Boling was 4 or 5–that means it was taken in 1932-33. I would just like to say this about my dad: It takes a strong man to live up to the definition of a “father.” But, it takes a remarkable soul to fill the description of “dad.” Wishing you a very happy 86th birthday on Sunday, December 7, 2014, dad.